Unintended Journeys is a photographic exhibit in collaboration with Magnum Photos on view until August 13, 2014 on the second floor of the National Museum of Natural History. This is the first post in a series exploring the relationship between humans and the environment, and the consequences of human migration and displacement. This post, and others about the exhibit, are a collaboration between George Washington University students taking Dr. Joshua A. Bell’s seminar Resources, Consumption and the Environment, as well as interns working with Dr. Bell on the exhibit project. The history of Homo sapiens isdefined by movement and interaction with the environment. For thousands of years humans have individually and collectively travelled around the world searching for better opportunities, searching for natural resources to exploit and as a result of being displaced by natural and human made disasters. These movements and the consumption of resources that they inevitably entail have only increased since European industrialization in the 19th century. With the enormous momentum of current human expansion, researchers are increasingly arguing that we have entered a new geologic time period known as the anthropocene. This new time period is understood as being distinct from the last 12,000 years because of the global environmental changes affected by humans. It is increasingly being argued that human related changes to the Earth’s environment could activate a new type of migration, an exodus from formerly fertile and habitable land found in areas all over the globe. Villagers walk in front of one of the few concrete buildings left in their village. In 2009, Cyclone Aila destroyed many protective dikes, causing flooding of the communities on the silt island of Padmapukur in the Ganges Delta. ©Jonas Bendiksen/Magnum Photos 2009. This image taken by Jonas Bendiksen in the Ganges Delta in Bangladesh in 2009 is a case in point. Wading through knee high floodwaters caused by Cyclone Aila’s destruction of the region’s protective dikes, displaced villages have had to abandon their homes, and at the time of the floods had to carry drinking water to their new homes. At the time this photograph was taken displaced villagers from Dakkhin Jhapa settled in makeshift huts and tents on the regions dikes. While it may be easy for some to dismiss this image as an event that happens elsewhere to other people, the same climatic shifts that have intensified Bangladesh’s monsoon season and have lead to the raising sea levels affecting the area, helped contribute to Hurricane Katrina which devastated the New Orleans and the wider Gulf of Mexico coast. Bringing these events into a visual dialogue with other natural and environmental disasters, Unintended Journeys explores the relationships humans have to their environments and how individuals, communities, Nation States and international aid organizations responded to these events. The show also asks visitors to think about the role of photography and media in shaping our perceptions of these tragedies. Unintended Journeys focuses on five natural disasters within the last decade: the impact of Hurricane Katrina (2005), the earthquake in Haiti (2010), the earthquake and resulting tsunami in northern Japan (2011) and the ongoing issues of desertification in northern Kenya and impacts of climatic shifts on Bangladesh. Collectively these events and processes are part of a growing trend of disasters worsened by mounting population pressures, increasing poverty, and shifting climate patterns. The wide range of cultures and environments in the exhibit allow us to think about the global connections that may exist between events separated by space and time. The show utilizes images taken by thirteen photographers of the award-winning Magnum Photos agency, renowned for its 65-year engagement with humanitarian issues. Collectively the images in this exhibit reveal humanity’s vulnerability to the unpredictable power of nature and the fragility of our relationships with the environment. They also demonstrate humanity’s resilience in the face of calamity. Each section of the exhibit depicts the impact of specific events and the resolutions communities utilized to address and cope with these impacts. These topics will only become more relevant in the next twenty years and beyond. In 2008, the Norwegian Refugee Council and Internal Displacement Monitoring Centre reported, at least 36 million people were abruptly displaced due to natural disasters. Similarly, the United Nations High Commission for Refugees predicted in 2009 that by mid century there will be between 50 and 200 million people displaced by climate change. The issues posed by rapid and accelerated change are the greatest challenges faced today and for the foreseeable future. Knowledge of our relationship with and impact on the environment is central to resolving the problems arising from these changes. According to the International Organization for Migration’s 2010 World Migration Report, migration increased from 150 million people in 2000 to 214 million in 2010, and could reach 405 million by 2050. While aggregate numbers of that kind are impactful, it is important to look beyond them into the lived outcomes of migrants’ lives. Though the events emphasized happened in the last decade, we are aware that natural and environmental disasters continue to affect different parts of the world in recent times as well — such as the Sichuan earthquake in China (2008), Hurricane Sandy in New Jersey (2012), and Typhoon Haiyan in the Philippines (2013). We invite you to learn more about environmental events no longer covered by the media but still affecting communities, and to reflect on our relationships with our environment and the impact of disasters on communities worldwide. We also encourage you to share your stories and experiences of an environmental disaster. If your story is selected, all or a select portion of it will be featured in the exhibit and on the Unintended Journeys website among other publicly submitted stories and images. Please click here for more information and to share your journey with us. Unintended Journeys Exhibit, second floor, National Museum of Natural History. Photo by Matthew Kennedy, 2014. Matthew Kennedy (MSU), Karlie Leung (GWU), Liza Floyd (GWU), Yousry Benayoun (GWU), Melanie Emas (GWU) and Joshua A. Bell (SI) contributed to this post. Cleaning a walrus isn’t much different from cleaning a Chinese water deer. Or a European mole, for that matter. In each case, all you need is a few simple tools and a lot of patience. Bringing along a few other mammals – species Homo sapiens–to help will make the job go faster. On February 12, the Museum’s entire exhibits department, including project managers, exhibit developers, graphic designers, fabricators, audiovisual specialists, modelmakers, and us writers, did some early spring cleaning in the Kenneth E. Behring Family Hall of Mammals. While the Museum’s janitorial staff cleans outside the cases on a regular basis, the interior of the cases and the specimens themselves hadn’t had a thorough cleaning in a while. That’s because it’s a slow, careful task that requires significant time. It also requires that the Mammal Hall temporarily close. Sure, visitors came to see mammals, but exhibits staffers climbing around inside the cases are probably not what they had in mind. The goal for the day was to spread out and cover as much ground as possible. To start, modelmaker Natalie Gallelli taught us how to lightly stroke a specimen’s coat with a soft brush in the direction of the hair growth, while holding a special vacuum tube attachment a few inches away from the specimen’s fur. Dirt and dust loosened by the brush get picked up immediately by the vacuum, but the hose never touches the delicate specimen. One of the most challenging specimens to clean was the giraffe, whose head stretches nearly 19 feet above the ground. AV specialist Patrick Rey used a mechanical lift to meet the giraffe at eye level, and then gently cleaned its head, neck, and upper back, while other staffers worked on the lower extremities. To clean specimen eyes and other delicate but rigid areas such as tongues, an alcohol-and-water solution is applied with a soft cloth. The fennec (a small Saharan fox), whose eyes had been coated with a fine film of dust, looked bright-eyed and alert again after a quick eye wash. It wasn’t just the mammals themselves that needed a good cleaning. Team members also swept and vacuumed case interiorsand cleaned exterior and interior case glass. One of the most time-consuming tasks of the day was cleaning each artificial leaf in the African Rainforest case. Six exhibits staffers spent several hours sitting cross-legged inside the case, painstakingly cleaning every individual leaf with cloths moistened with water. The difference was striking—afterward, the leaves glistened as if they were really part of the flora in the southwestern tropic region of Africa. The National Museum of Natural History (NMNH) is home to more than 127 million collection items. These specimens and cultural artifacts come in the shape and size of pinned insects, pressed plants on paper, animals preserved in alcohol, intricately crafted textiles and large dugout canoes. They are found from as far away as outer space, to as close as your own backyard. Explorers and researchers have been collecting artifacts and specimens for the NMNH for more than 150 years. The museum is also home to more than 100 curators and collection managers whose job it is to ensure the preservation and safety of these collections. There are seven distinct scientific departments with collections staff whose specialty it is to care for the collections in their respective departments: Anthropology, Botany, Entomology, Invertebrate Zoology, Mineral Sciences, Paleobiology, and Vertebrate Zoology. 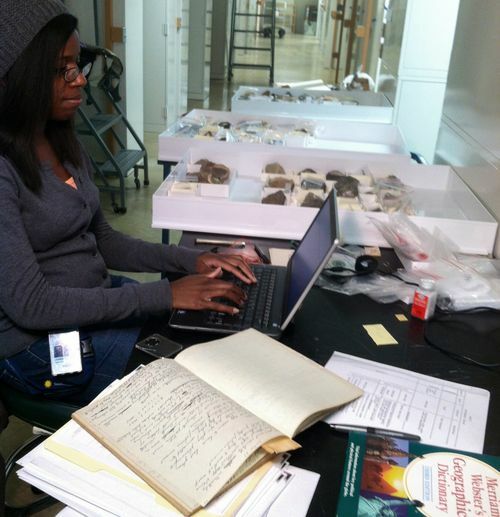 Collections Program Technician, Amanda Lawrence, cataloging rock and ore specimens from Tobago for the Department of Mineral Sciences. Photo by Erin Bilyeu. Through its research and laboratories, libraries and collections, exhibitions and education programs, the NMNH is one of the world’s greatest repositories of scientific and cultural heritage. The collections at the NMNH play a vital role for researchers from the Smithsonian and around the world. Scientists working behind the scenes in the museum, at our research stations, field sites and storage facilities, use collections to observe changes over time in biological diversity, climate, and the universe around us. Using the collections to understand our past and present helps guide us in leaving a positive impact on our planet and increasing its future sustainability. Pinned insects from the Department of Entomology on display at the National Museum of Natural History. Photo by Julie Hoskin. To make the collections more accessible for scientists, researchers, and students they must be digitized and added to the online collections database. In an effort to help digitize collections (scan, photograph, update electronic records) of such great size and importance, a team of collections technicians known as the Collections Program Technicians (CPT), are working across the scientific departments on a variety of digitization projects. 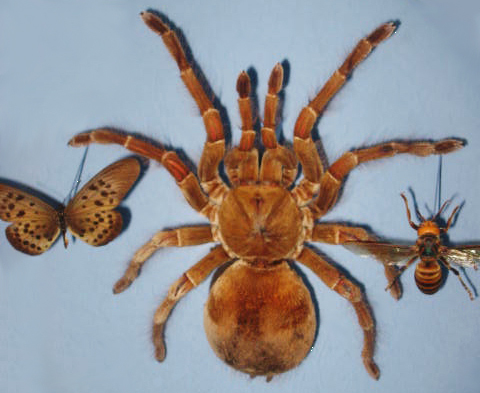 Once digitized this collections information can be made available to researchers and the public via the NMNH’s searchable online collections database. We would like to share with you a little more about the projects we are working on and the scope of work the specimens require to be sustained over time. We look forward to sharing with you about the projects we are working on and the variety of collections we are working with in future blog posts. We hope you find the specimens and collections as fascinating as we do! 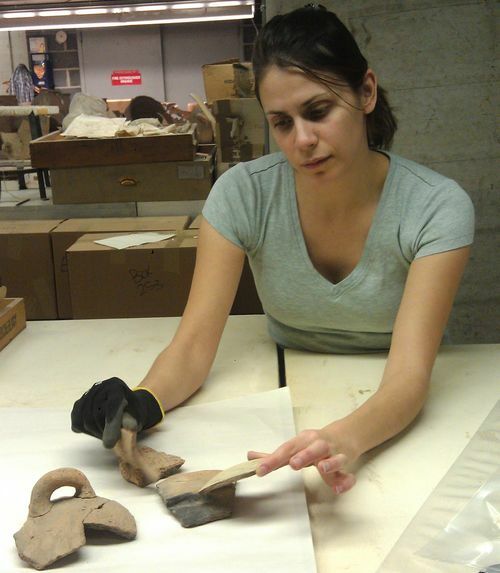 Collections Program Technician Laura Tancredi working with pottery sherds from Israel in the Department of Anthropology. Photo by Julie Hoskin.